Has 8 channels; each may be an input and/or output. Inputs accept up to 27* volts DC. Input channels 1 and 2 report; pulse counts, activity latch & input states. Input channels 3 to 8 report; activity latch and input states. Outputs are open source and can sink up to 1 amp. Connections have independently controlled pull-down resistors. 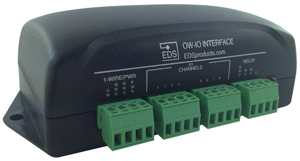 Compatible with all EDS and Maxim 1-Wire bus masters. Optional Relay may be controlled independently or by alarm status. LED may be controlled independently or by alarm status. Support Conditional Search with user-selectable conditions. Automatic unique 64-Bit device addressing. Applications include thermostatic controls, industrial systems, flow meters, consumer products, or any system in which discrete control or monitoring is necessary. 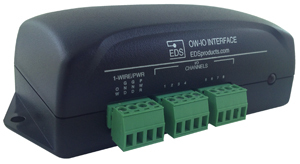 The 1-Wire Octal (8 channel) Discrete I/O device offers an innovative way to monitor and control up to 8 digital channels. Each of the 8 points may be an input or an output under program control. Each channel also includes an activity latch, a programmable pulled-down resistor and programmable high / low alarms. Furthermore, channels 1 & 2 include 32 bit pulse counters. Activate when an alarm becomes active and automatically deactivate when the alarm is cleared. Activate when within alarm parameters and deactivate when within normal range. The nearly instant automated responses made by the LED and optional relay allows appropriate reactions (activate fan/alarm siren/etc.) to occur before the monitoring application is even aware of an alarm. 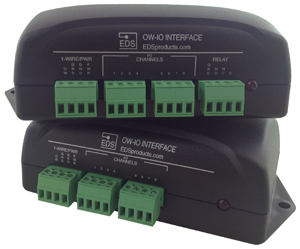 The Octal Discrete I/O has been designed to simplify the reading and controlling process; and therefore any general-purpose 1-Wire host adapter is able to read and control the discrete channels. All of the Octal Discrete's data is contained in three 32 byte memory pages being updated in real time. More details on the Octal Discrete is available within the User Manual. * The maximum input voltage may be extended to 48 Volts by disabling the pull-down resistor.